A quick search on the internet of the phrase Books on Unicorns will quickly reveal a never-ending assortment of titles. I must confess I have read none of them, but one title did get my attention; Zombies Vs. Unicorns (by Holly Black). Good grief, as if it’s not hard enough to gallop along with a large horn in the middle of your forehead, to then turn the corner to a hoard of Zombies. Anyway, Unicorns are supposed to be mythical creatures. The starting point appears to be a beautiful white horse with a solitary horn growing out from the middle of its forehead. 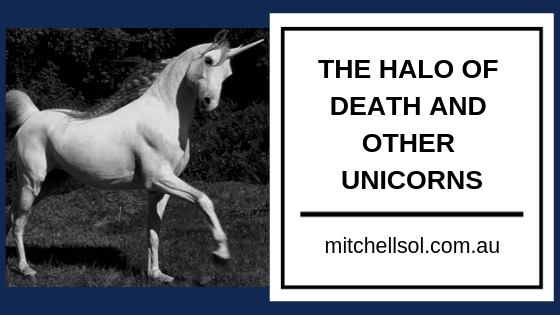 In estate planning, there are other mythical creatures: one that I come across quite regularly is best described as the Halo of Death. Quite often people, in choosing executors for their will, surprisingly pick a son or daughter who may have a loose relationship with one or more such virtues of truth, kindness or playing well in the sandpit. Nonetheless, they are chosen, as the client remarks that they will do the right thing. It is at this point in time that I pause as I can almost see the glaze in my client’s eyes as they are fast forwarding to that moment in time immediately after their demise where a children’s choir is singing in the background and a halo descends upon an otherwise troubled soul. The best people to appoint as executors are honest, fair-minded individuals, who are able to get on with others, are not unwise with money and who will seek proper advice and follow it. If two or more people are appointed who do not get on, then the story usually ends with lawyers at fifty paces and great expense. The Halo of Death will not suddenly appear and bring peace to all. Similarly, appointing a son or daughter who does not behave well now in the hope that the Halo of Death will visit upon them is a brave move. In reality, poorly behaving individuals who are chosen as executors will not suddenly change their conduct, despite someone passing away. 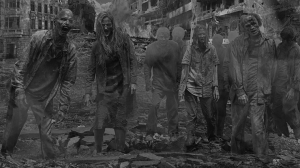 The Halo of Death may descend for a brief moment, but it would seem is very quickly eaten up by Zombies. I like the notion of a Unicorn, though that horn that large pointy horn does worry me a bit. As for the mythical creature The Halo of Death I can’t imagine there would be too many books written about it. Perhaps a series of short stories could be written by a solicitor who has seen far too many executors doing the wrong thing who should never have been appointed in the first place. Bryan Mitchell is an Accredited Specialist in Succession Law (Wills & Estates) Qld. There are only 44 Accredited Specialists in Succession Law (Wills & Estates) in Queensland out of roughly 13, 000 lawyers, and Bryan Mitchell is one of them. We offer a FREE 10-minute phone call consultation. Please contact us on +617 3373 3363.